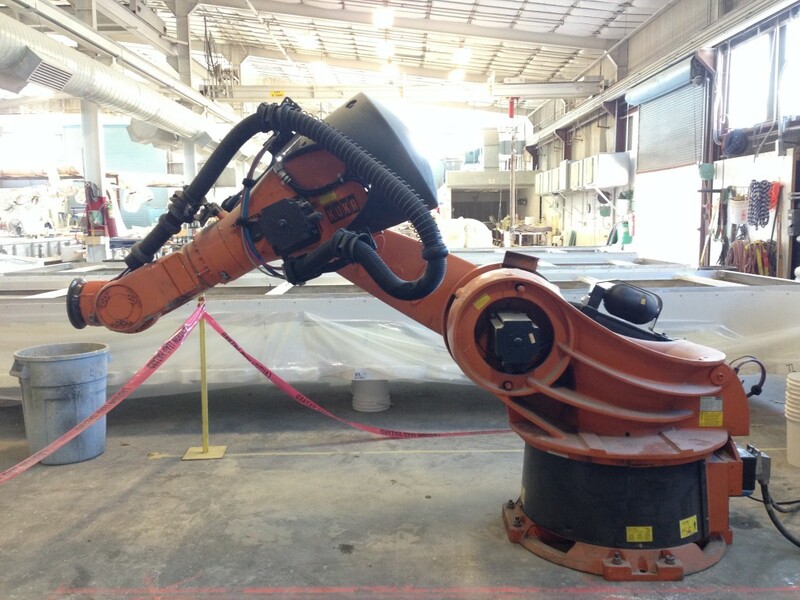 At Kreysler & Associates we’ve decided to purchase a used Kuka robot. We found an “assets solutions” company in Michigan who has warehouses full of a couple hundred used Kukas. Most of them were made around 2004 and evidently were built for GM according to their own special specifications. Apparently GM’s specs have a few unique features which we anticipate will make these robots a little bit trickier to adapt to our own uses. That, and their age sound like they are going to be the roots of whatever challenges are to come. We had originally intended to buy a KR 150 with a KR C1 controller. I was warned by many that these older controllers lack versatility, are pretty far out of date, and lack much support. So at the last minute we decided to spend a little more and get a KR 350 with a KR C2 controller. Realizing that a machine such as this can be adapted to many uses, our “target project” is to teach it to spray gel coat into foam molds for FRP layup. We are currently fabricating facade panels for the SF MOMA, so naturally this will be the source of the geometry we will test on. To share knowledge and hopefully spare someone else the headaches of figuring this all out for themselves. As a reference, especially for the relevant manuals which I found scattered all over the internet. To get connected to others working on the same or similar challenges. I know there’s a bunch of folks out there right now with the exact same robot.